Beds and borders: Once the ground stops freezing, you can create new beds and borders. February is a very cold month but begin to brainstorm how to best put your winter planning into action. When the weather accommodates, you’ll want to fill a bottle with sand, which will be slowly poured onto the ground as you trace the outline of the shapes you wish to create. The top layer of plant life within those lines will need to be removed. The soil should be dug over next, with plenty of organic material added to the mix in the process. Save any discarded turf; it will eventually make fantastic compost. Bird-friendly plants: Have you enjoyed feeding birds throughout the winter? While animals appreciate man-made houses and feeders, trees and shrubs provide shelter and snacks naturally. Look for varieties like crabapple and hawthorn, which boast canopies and small fruits. If you have a fruit garden, situate these animal-friendly trees and shrubs on the opposite end of the yard to distract birds from your produce. Plant trees: There are many kinds of trees that add life to yards and complement gardens, in fact. As long as trees remain dormant, you can add more. Trees that aren’t planted at the correct depth or watered the right amount for their species fail to grow, however, so study best practices to set yourself up for success. Prune: By the end of winter, deciduous trees need to be pruned. Remove unsightly and unhealthy branches, as well as sprouts emerging from the bottom of trunks. After the harshest winter conditions seem to have passed, fruit trees and grapes should be pruned as quickly as possible, before blossoms start to appear. Many other varieties that bloom after June 1 can be pruned too; just do some research because there are exceptions. Fertilize: During that window of time, fruit trees also need to be fertilized, so kill two birds with one stone while you’re already out there. In February, cool-season grass like fescue could also use its first fertilizer layer of the season. Irrigate: Did your lawn experience dry conditions for four weeks or more this winter? It may need watering, whether or not spring has sprung. If the answer is yes, wait for a relatively warm day this month, then add one inch of water to your lawn. When necessary, this effort simultaneously helps soil retain warmth and keeps warm-weather grasses alive. Cuttings: Cuttings from houseplants often make for convenient late-spring bedding. Collect cuttings from houseplants like lantana, geranium, coleus, heliotrope, fuschia, and begonia now to fill out your warm-weather garden. Start vegetables: It’s good to be excited about planting season, but try not to jump the gun when starting vegetable plants indoors. Fast-growing types like cabbage need six weeks to develop on their own before being transplanted outside. If you’re getting antsy, ready low-growing types, which can be started earlier; varieties like peppers need a full eight weeks. Paint: Prime your outdoor things for spring! 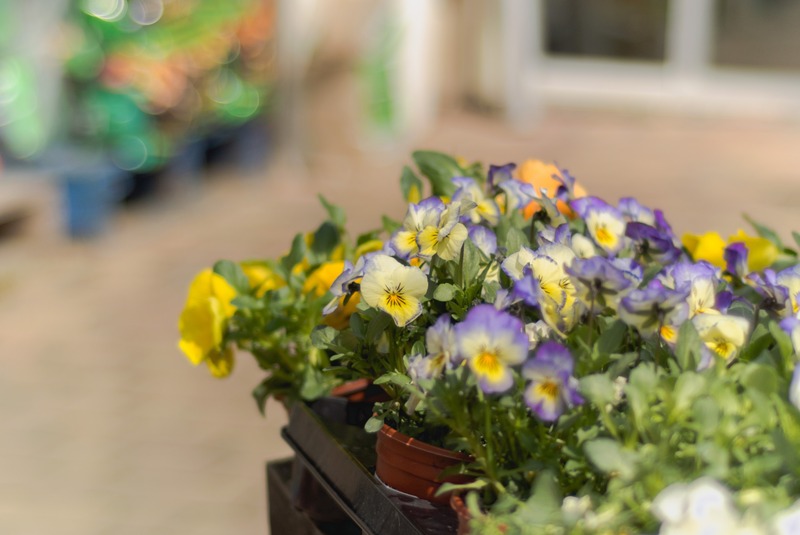 Window boxes, yard furniture, tools, and other garden-related objects that have seen a few seasons come and go may need a fresh coat of paint at this point to look their best. Have fun with color; brightly hued garden tool handles stand out, making them easier to find even after a long day of gardening. Experiment! : As you’re putting together this year’s gardening lists and itineraries, don’t forget to experiment. Mix things up by planting flowers, vegetables, and fruit that you’ve never tried to grow before. Think of everything you can learn and, more importantly, all the home-grown meals you can attempt if these experiments are successful! Here’s a suggestion: give the new dwarf varieties of vegetables a whirl; they require less space while still producing quite the bounty. Fall bulbs: Don’t forget about autumn bulbs! Varieties like dahlias, gladioli, cannas, and lilies won’t flower until fall, but you can take advantage of the best selection now by browsing before they’ve been picked over. Once temperatures rise to 55°F, you’ll have everything you need to start planting in anticipation of fall. Planting schedule: Study your favorite gardening staples and make note of key dates; sticking to an appropriate planting schedule pays off in the end. For instance, timing is especially important for some annuals like lobelia, petunia, vinca, browallia, snapdragon, and verbena, which develop relatively slowly.